April 5 – April 7. We met a cruiser in Staniel who said she loved to Party! and thought the only reason to go to Black Point was to do laundry. But as you can see by this brand new sign, there is lots going on in Black Point. You never know where you will find the party! We have one month left. Our first two seasons we decided when it was time to go back. Blue Wing and crew were seemingly held together by twine and bandages. This season weâ€™ve simply run out of time. Oh, weâ€™ll return a different way and visit new places. But deep inside we know itâ€™s really over. As we walk around Black Point seeing familiar faces we wonder if and when weâ€™ll return. And will Black Point even be the same? Saturday morning we take our long-overdue laundry in for a wash. Ida isnâ€™t there, so I go behind the counter and get tokens for the machines. Weâ€™ll pay her when she shows up. We use the wi-fi and compare travel notes with more cruisers as they drift in. We trade a few books at the book swap. After the laundry is back on the boat we hit the book swaps at Deshamonâ€™s and Lorraineâ€™s. We get a couple of plates of sides from the school BBQ fundraiser and take them to Scorpioâ€™s where we can wash them down with some cold Kalik beers. We chat with a cruiser and with Zhivago, the owner. Zhivago has finished a new deck and is still doing work on his online gaming room. We visit Lorraineâ€™s, sitting outside under the trees. Across the street is a group of Bahamian guys. Usually they sit on the porch and play dominoes. Weâ€™ve never felt it was appropriate to intrude on their game. Today they are listening to loud dance music coming from under a tent down the street. One guy waves. We go over and find out that there is a big party starting at 5pm. Everyone is welcome. We go back to the boat to freshen up. This could be the last civilization we see for a while. We decide to go back ashore for one of Deshamonâ€™s outstanding pizzas. Then weâ€™ll check out the party. We go in to find that Deshamonâ€™s is closed. We see Diane and her man at the party. Heck, everyone is at the party. We see Lorraine, who says sheâ€™ll be serving supper would be glad to make us some veggie burgers. 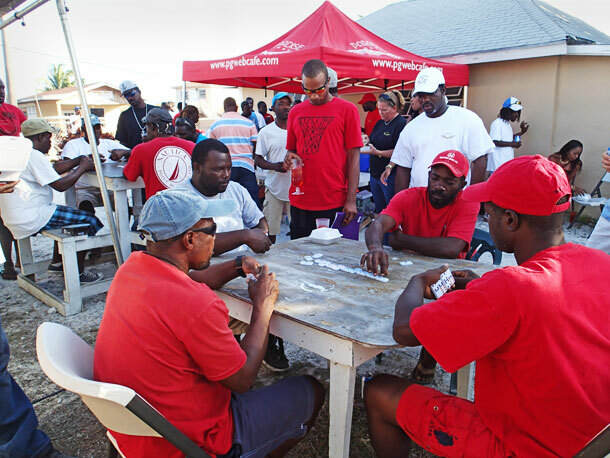 The party is sponsored by Paradise Games, an online gambling establishment with physical sites in Nassau and Freeport. They are celebrating the grand opening of a site here by the laundramat. Locals are being treated to a free BBQ buffet, bottomless bar of free drinks (they wonâ€™t even take tips), a DJ, and a raffle for a flat screen TV. For us, though, the exciting part is the domino competition. 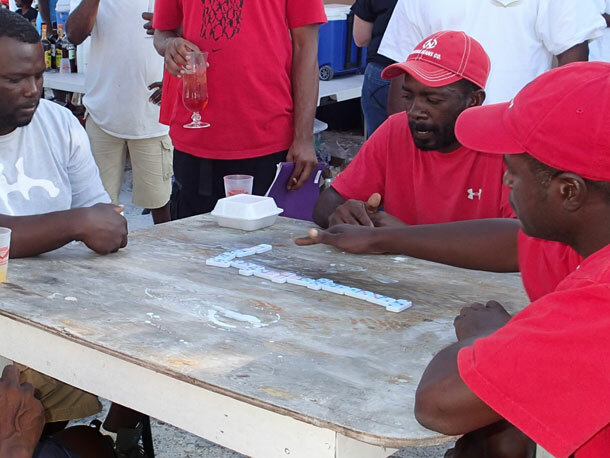 Weâ€™ve seen groups of Bahamian men playing all over the islands. But weâ€™ve never gotten close. The contests are intense. Two pairs of guys (no women here) compete, with partners trying to read each otherâ€™s plays to determine what everyone is holding. Etiquette dictates that a man slam his tile down when playing, and when passing give the rickety plywood table a good thump. Often the tiles must be re-aligned after a play. There is no talking, but a lot of meaningful eye contact. The pace is fast. The end of the match is signaled by a particularly emphatic slam, which send tiles in all directions. No one cares about the tiles any more, though. There is a lot of yelling and, of course, fist bumping for the victorious pair. We go to Lorraineâ€™s for supper, sitting beside Trish and Phil from Enchantee. They are from Australia, but bought their catamaran in France and sailed it here. They say the Mediterranean is a great cruising ground, especially Greece. They think France is a little too border-conscious. Phil tells of a French helicopter, hovering close overhead as they sailed in foul weather, insisting that he spell out the name of his Australian hailing port â€“ Mooloolaba. They enjoy the same remote places we do, but they like to eat out a lot. Trish was insistent that Lorraine serve supper saying (tongue in cheek) â€œWeâ€™re quite pitiful, you knowâ€. Back on the street the party was still going strong. We talked with a couple more cruisers and all agreed that we were in for a night of loud booming music. Then the winner of the flat screen TV was announced and the party was suddenly over. By the time the winner hauled his TV up the street the Paradise folks had folded everything up. In minutes we were rowing out into the quiet night. From here we plan to weather the next front at Cambridge Cay. Then we sail up to Highbourne Cay and northwest to West Bay, New Providence. Following that we hope to explore the Berry island chain and the Bight of Abaco. It may be a while before our next post. Will we come back to Black Point? Probably not for years. When we do will it still be a charming settlement, or a big resort and gambling mecca? Not sure, but weâ€™re glad we got to know the place this past two seasons. Some of the women of Black Point dishing up BBQ. 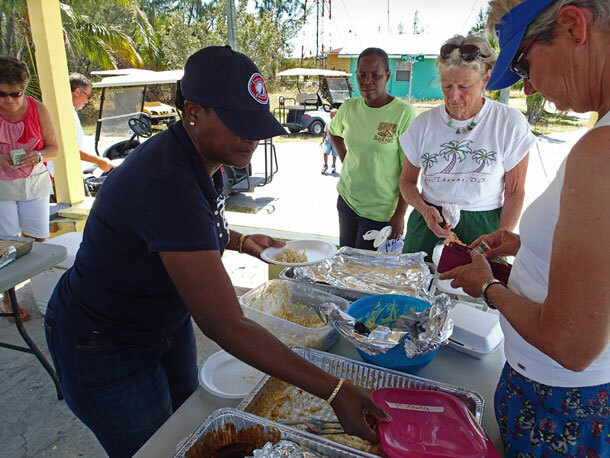 At very left edge of the photo is Peg, an American expat who lives on the island, in the dark blue is Ida who runs the laundramat, cuts hair, rents cottages, and cooks the best conch fritters, in the green shirt is Diane, who runs the DeShamon’s restaurant (where you can get the best pizza in the Bahamas – aside from our boat) and runs the airport, next to Diane is Jean, another American expat living on the island who is always volunteering for something. Here comes a tile slam. The referee knows to lift his drink off the table. Wishing good weather for you on your way home. Again, very nice sums it up. BP was great, the sign at laundry says “laundermat”. $4 for a shower that was well worth it. 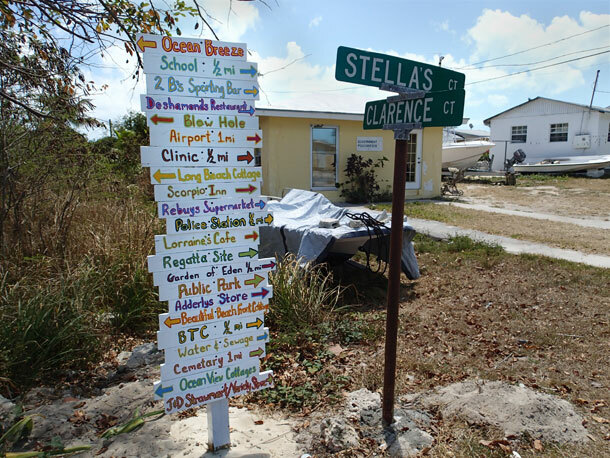 Are you anywhere near Eleauthera?